Arthritis is a general term meaning an inflammation of a bone joint. More than 100 diseases have symptoms of bone joint inflammation or injury. This condition—the body's response to tissue damage—can cause pain, swelling, stiffness, and fatigue. Since the areas most commonly involved are the hands, arms, shoulders, hips, and legs, any action requiring movement of these parts becomes difficult. Arthritis is usually a chronic condition, meaning it persists throughout a person's life. Osteoarthritis and rheumatoid arthritis are the two most common forms of the disease. Osteoarthritis occurs as a result of aging or injury. Rheumatoid arthritis is an autoimmune disease, meaning that the body produces antibodies (chemicals that fight against foreign substances in the body) that act against its own tissues. Osteoarthritis is the deterioration of the cartilage (connective tissue) covering the bones in the joints of the body. It is most often seen in people over the age of forty. Causes of osteoarthritis include wear and tear due to aging or overuse, injury, hereditary factors, and obesity. The wearing away of the cartilage results in the bones scraping against each other, causing the deep joint pain characteristic of this disease. The joints most commonly affected by osteoarthritis are those of the knees, hips, and fingers. Other areas can be affected by injury or overuse. The condition can cause minor stiffness and pain, or it can result in severe disability. Treatment of osteoarthritis includes the use of anti-inflammatory drugs such as aspirin to reduce pain and swelling; supportive devices such as a brace, walker, or crutches; massage; moist heat; and rest. 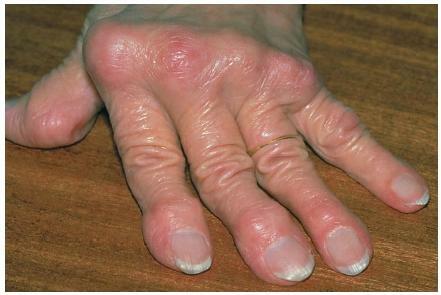 Rheumatoid arthritis is one of the most crippling forms of arthritis. It is characterized by chronic inflammation of the lining of joints. It also affects the muscles, tendons, ligaments, and blood vessels surrounding these joints. Deformities can result from the deterioration of bone, muscle, and tissue, impairing function and affecting mobility. Rheumatoid arthritis can occur at any age but usually appears between the ages of thirty and sixty. Three times more women than men are stricken with this disease. autoimmune response in genetically predisposed people. People with rheumatoid arthritis produce antibodies that attack their own body tissues. This sets off an immune response that results in the body's release of chemicals that produce inflammation. Treatment of rheumatoid arthritis includes aspirin therapy to reduce inflammation and relieve pain, application of heat to joints and muscles, rest, and physical therapy. In some cases, surgery may be required to reconstruct joints that are destroyed. Anti-inflammatory: A drug that reduces inflammation. Autoimmune disease: A disease in which the body's defense system attacks its own tissues and organs. Bone joint: A site in the body where two or more bones are connected. Cartilage: The connective tissue that covers and protects the bones. Immune response: The body's production of antibodies or some types of white blood cells in response to foreign substances.